_ _ I made my friend Jackie some of these noodles today and she was so impatient for me to post them that I promised I would, but after a long night at work I just don’t have the gumption to come up with a creative or witty accompanying story. I’ll come back to it… eventually… maybe. 1. Bring a large pot of water to a boil and cook the pasta until soft but not mushy– the vinegar will help to break down the pasta slightly so you don’t want it to start too soft. When it’s done, drain the pasta and set aside. 2. Combine all the remaining ingredients except the sesame seeds and green onion in a small bowl or, as I like to do, just put it all in a liquid measuring cup. Microwave for 15-20 seconds and mix thoroughly so the honey combines with the rest of the ingredients. 3. In a large bowl pour the liquid mixture over the pasta and toss. Allow it to chill in the fridge for at least an hour until it’s entirely cold (you can serve it warm but it’s just so much better cold). There will be remaining liquid at the bottom of the bowl so I like to toss the pasta a few more times to make sure it’s totally coated. 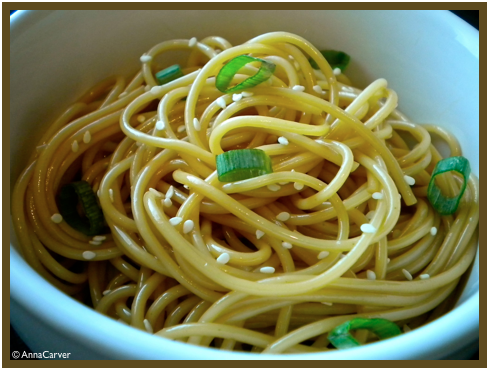 Serve garnished with sesame seeds and sliced green onions. You are a woman who knows her stuff! They really did mellow out and were even more yummmmmy! I only wish I had practiced a teeny bit of self control so I still had some to eat right now… Contemplating making another batch. Decisions, decisions! Previous Previous post: Get Dressed!